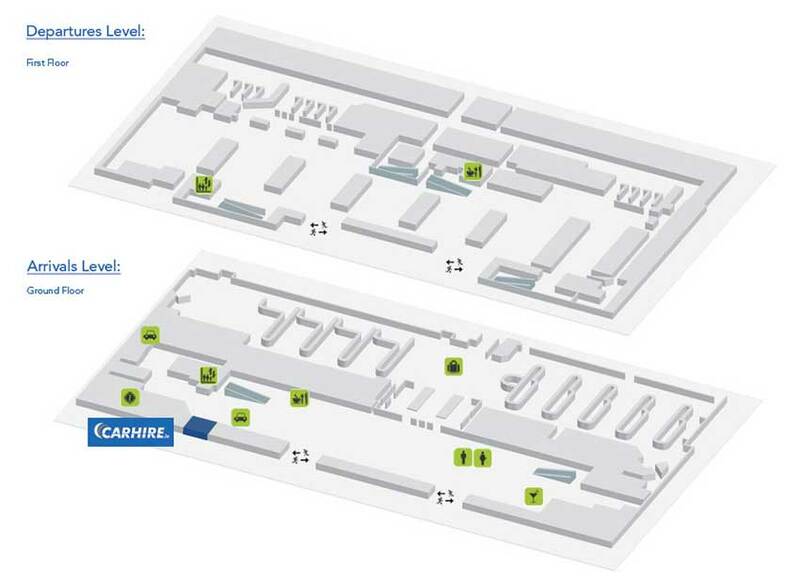 Above you’ll find a map of Terminal 1, courtesy of Dublin Airport Guide, which outlines where you can find our desk so we can get you on your way as quickly as possible. We are located on the ground floor of the Terminal 1 building. As you exit baggage reclaim simply turn right and look out for our desk partner Europcar Car Rental. Our friendly staff will be ready to help you on your way. Terminal 1 features a wide range of facilities and amenities. Useful resources include internet and printing facilities, baby changing facilities, dedicated medical staff, reduced mobility services and play areas for children. Once you pass through security you will enter the loop, an area packed with shops which includes duty free shopping. More info on the loop can be found here ( http://www.theloop.ie/ ). Once you’ve passed through the shops you’ll find a range of restaurants that offer top quality food and drink services for you to avail of while you wait for your flight. Terminal 1 has a range of transport options to avail of. Public bus routes are available from Dublin City and nationwide locations. There’s a taxi service found right outside the terminal as well as a choice of car rental companies in Terminal 1 where you’ll find CarHire.ie which has a desk partnership with Europcar offering you a great fully inclusive service at Dublin Airport T1.